Save energy; win attractive cash prizes. This is an open challenge by Green Energy Foundation (GEF) under its Switch2Green initiative. In a bid to encourage energy savings practices in households in Bengaluru, GEF has launched this competition with the support of Racold Thermo Ltd under its CSR initiative. Housing societies and flats comprising minimum 100 flats are eligible to take part in the competition. November 30th is the last date for registration. To participate in this competition, housing societies/ flat owners must form an Energy Management Committee (EMC) under the leadership of its chairman. After the enrollment, an audit of the performance of the nominated housing society will be done through volunteers and evaluated by a jury panel. Based on the analysis of the energy savings programs and initiatives undertaken by the Energy Management Committees, winners will be decided. The first prize has a cash award of Rs 200,000, while second and third prize winners will get Rs 100,000 and Rs 50,000 each. GEF is planning to cover 10,000 to 12000 households in Bengaluru city through this initiative. At Pune, this initiative saved 48,000 units of energy in 8,000 participating households. Sharmila Oswal, President of GE Foundation, observed that conserving energy begins at home. Small changes are easier to accomplish than larger ones. Gradual changes are financially easy to implement and provide financial reward in the long run, along with the satisfaction of conserving energy to protect the planet and its natural resources. Energy conservation tips are a win-win for everyone involved. Switch2Green initiative expects enthusiastic participation from the citizens of Bengaluru which will lead to substantial energy savings. Interested flat owners, residents, resident welfare associations can contact Jayanth on 09886102219 or send in their entries by mail: jayanth751@gmail.com. The content has been provided by the Green Energy Foundation, and has been published with minimal editing under the Message Forward section, a space meant for non-profit public interest messages by individuals and organisations. Mark your calendars as city council elections are all set to take place on March 28th. Counting and results on April 5th. 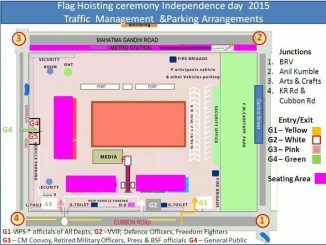 Traffic in and around MG Road will be diverted on I-day from 8.30 to 10.30 am. Attendees are not allowed to carry phones, cameras and umbrellas to the venue.